So many forces keep Fun Home aloft that listing them threatens to emphasize the mechanical side instead of celebrating the exuberant emotional effect. The 2015 Tony Award-winning musical flies from joy to sorrow, explores themes of family dynamics and sexual identity, and innovates storytelling itself. It can be silly, and it can take your breath away. Weston's production benefits from stellar performances by theater mainstays David Bonanno and Susan Haefner, who bring out complexities in their characters even as they make them soar. The musical is based on the acclaimed 2006 graphic memoir Fun Home: A Family Tragicomic by Alison Bechdel, Vermont's cartoonist laureate, who tells her own story of coming out just before she discovers her father's denial of his own homosexuality. Alison's new life starts just as her father's ends, in suicide. Lisa Kron dramatized the memoir by relying on the musical genre's fluid transitions from song to dance to speech. These shifts become leaps in time and space as Alison recalls her childhood with a father who was both hero and tyrant to her. The contrast between her happiness in accepting her sexuality and her father's misery in hiding his is handled with both humor and despair. Kron anchors the show around Alison's impulse to understand her family. Alison is portrayed by three actors, playing her in childhood, at college and in the present. The grown-up Alison is in the act of writing her memoir, and she wheels her drawing table up to the edge of each scene to sketch or observe as her memories take shape in the actions of her younger selves. Bruce Bechdel has a complex relationship with appearances. He's an obsessive historic preservationist, tirelessly renovating the family home and indoctrinating his children in the liberal use of furniture polish. Working as a high school English teacher and the operator of the family's funeral business, he is always attentive to surfaces, especially his own. As he assures a grieving funeral customer, "We remove all signs of trauma." If only he could hide his doubts and passions as successfully from himself. Alison grows up accepting family idiosyncrasies as normal, and a father who instills a love of books and aesthetics gives her a great gift. But Bruce keeps an icy distance from his three children and vents his frustrations on his wife, Helen. Dramatically, the show uses quick, laser-focused scenes. Director Malcolm Ewen stages the play with furnishings on casters, shuttled on and off to re-create places that flood into Alison's memory. Transitions into song are elegant, and every word is spoken with the emotional freedom of music. The score by Jeanine Tesori quotes Motown and Chopin but chiefly moves energetically between plaintive and joyous. Tesori brings one song to the edge of dissonance to reveal the family's own disharmony and produces full-throated anthems to mark key stages of Alison's life. Bonanno builds his moving portrait of Bruce from keen attention to all the character's contradictions. One moment he lifts his jaw in quiet vanity, the next he casts his eyes down in shame. Though Bruce is a tragic figure, Bonanno grounds him in the mundane, showing his power over the family through small acts of impatience. When a new house draws Bruce into his restorer's furious cycle of destruction and resurrection, Bonanno boldly reveals his vulnerability in a song that left last Friday's audience in rapt silence at its conclusion. As Helen, Susan Haefner fuses fine singing with evocative performance. Helen has helped Bruce conceal his tantrums and his passions, but when she takes stock of a life of making excuses, Haefner turns that pain into a poignant hope that Alison will never make such a mistake. Andrea Prestinario plays the present-day Alison and, for much of the play, is a distant narrator and observer. But as her father's tortured life in the closet becomes clear to her, Prestinario shows Alison grappling to see his cruelty and kindness in a new light. As she relives her last conversation with Bruce in a song, Prestinario's vivid vocal shows the character's urgent wish to have done more with that one fleeting chance to connect. Playing small Alison, Ava Lynn Vercellone already knows how to command a stage and plunges into the story's strong themes with courage and clarity. When Alison discovers a female role model, and thereby discovers herself, Vercellone makes the discovery occur before our eyes. Caitlin Kinnunen, an especially fine singer, is the college-age Alison. With a warm smile and a too-cool hat, Holly Gould makes Joan, Alison's first love, worth coming out for. From a gangly high schooler to a buff landscaper, Adam Shonkwiler appears as various male objects of Bruce's affection and in a wonderfully silly singing role. As Alison's young brothers, Emmett Smyth and Ryder Scott are good dancers and singers. Shaking their butts in 1970s bellbottoms, these two can do no wrong when they and small Alison cavort in a commercial they improvise for the funeral home. Scenic designer Howard C. Jones crowns the stage with a gothic revival bargeboard and pointed window that evoke Bechdel's drawings of her home in rural Pennsylvania. The lighting design, by Stuart Duke, sharpens each scene with color and mood and the occasional big effect. 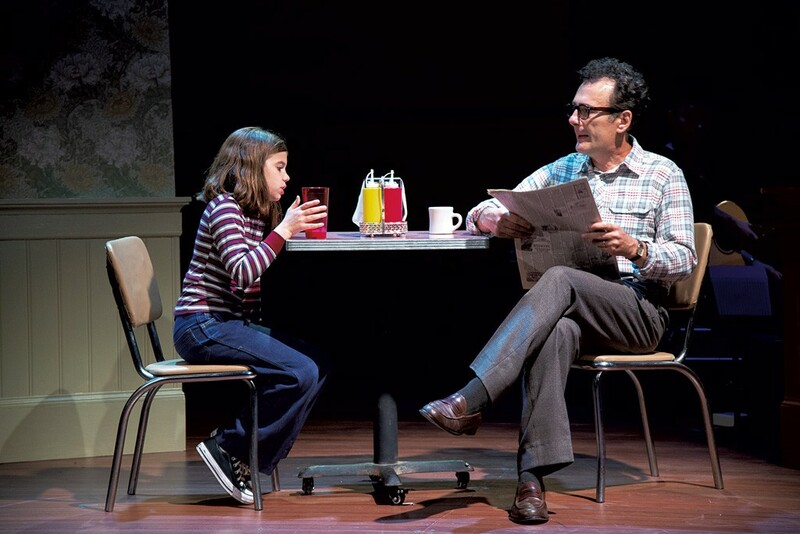 Fun Home is about a particular family, told in a particular way. If a closeted funeral director and his lesbian cartoonist daughter seem exotic, they become universal before the last song fades. Bruce is terrible and wonderful, the extremes that describe most people as seen by their families. In this production, his loss occurs with all the power of theater, unmuffled by irony. What Alison draws are cartoons, but her characters are many layers deep. The original print version of this article was headlined "In This Home"
Video: A Very Vermont-y Version of "A Christmas Carol"